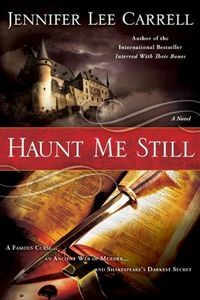 Haunt Me Still by Jennifer Lee Carrell, a Mysterious Review. Review: Jennifer Lee Carrell tackles the mystery (really, mysteries) surrounding the origin of the the Bard of Avon's "Scottish Play" — in theatrical circles, there is a taboo against naming it — in Haunt Me Still, the second entry in this series featuring Shakespearean scholar Kate Stanley. Kate is both flattered and a little bemused when Janet Douglas, now known as Lady Nairn, a famous film and stage actress — famous for both her stunning performances and her sudden departure from public life 40 years ago — asks her to direct a single performance of Macbeth. Lady Nairn's husband, now recently deceased, was an avid collector of anything Shakespearean, and in particular, anything having to do with the playwright's supposedly haunted play Macbeth. The performance will feature Lady Nairn's late husband's extensive, even eclectic, collection as part of the play. But Lady Nairn has an ulterior motive in asking Kate to be involved: she thinks her husband may have been murdered, Kate uniquely qualified to help identify the killer. "Knowledge, the oldest temptation," Kate muses, and "caught in the tug of curiosity", she agrees to do it. When done well, literary mysteries as part of modern (fictional) mysteries can be a magical combination, a term most appropriate for Haunt Me Still, with its underlying occult theme — although, as Kate points out, "occult" historically means "hidden, obscured, secret, not magical" … yet all terms aptly apply in this book. Atmospheric almost to a fault, most of the action takes place in a beautifully rendered Scottish castle, where murder soon takes center stage and Kate the unfortunate lead suspect. Though there are references to earlier tragic performances of Macbeth — a prologue set in the early 17th century hints at more mystery and danger — the main plotline is fairly straight-forward and moves along briskly. About the only thing that doesn't work is the on-again, off-again, on-again? relationship between Kate and security consultant Benjamin Pearl, who conveniently seems to be in the right place at the right time. But this is a minor quibble in a story that is otherwise exceptionally captivating, at times riveting — even for those readers who shunned Shakespeare in school. Acknowledgment: Penguin Group provided a copy of Haunt Me Still for this review.